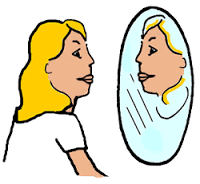 How to you feel when you look in the mirror? Are you disgusted by some of the changes you see? Or do you get a sense of pride and gratitude? The way we feel about ourselves as we get older has a major effect on the way we age. More than you may have suspected. So watch those thoughts while gazing. I know many people are not psyched about aging. But it helps to know how much it matters. If you spend most of your time bemoaning the changes, you are doing yourself harm. Becca Levy and colleagues looked at people who had participated in a study 20 years before in which they were asked to respond to numerous statements, such as “Things keep getting worse as I get older.” They found that those who held more positive thoughts about aging lived on average seven years longer. Their perspective alone added years to their life! Harvard researcher Ellen Langer wrote about this study in her book, Counterclockwise, and reported that the effect of a positive attitude on how long a person might live was bigger than the effect of all other strategies, including managing blood pressure, cholesterol, exercise, and smoking. No matter how you changed those things, your attitude and viewpoint count more. Langer concluded that what we believe “might be one of the most important determinants of our life span,” so notice the attitude you have right now. Living longer isn’t much of a goal by itself, but living longer with well-being is. If you are interested in good health, you may know some things that will contribute to that goal. But if you’re struggling to keep up an exercise regimen or haven’t been able to lower your cholesterol without meds, maybe a good place to start is with the way you think. Starting with your attitude about aging. Look in the mirror. Pay attention to the first thing that comes to mind. If it is not loving, not affirming, not appreciative, choose a different thought. Meaningful change outside begins within. As you shift toward a more positive view of aging you can feel better about yourself, be more motivated to take necessary action, and do more to help yourself live longer with greater well-being. That’s worth a thought. Love those little jowls? HMMMM… I definitely need to raise my gaze!